Almost 6% of America’s population are millionaires. And while you might expect to find them in the nation’s largest cities; you may be surprised where a millionaire resides these days. Here are where America’s millionaires are living in 2018. According to reports; Kiplinger, publisher of business and financial information, joined with Phoenix Marketing International to find where the millionaires live. They looked at 933 urban areas, cities and towns with at least 50,000 people. The area where most of America’s millionaires call home is the Bridgeport-Stamford-Norwalk area of Connecticut. This southeastern Connecticut area is in close proximity to NYC. About 9% of the population in this area, roughly 31,506 people, can call themselves millionaires. That is, having at least $1 million in the bank or investments. Many, of course, have a lot more. Other areas on the list include Washington, D.C. and Saint Mary’s County in Maryland. San Francisco, California came in 5th on the list. Just looking at the overall numbers, there are more of America’s millionaires living in California than anywhere else (about 800,000). Texas, New York, Florida, and Illinois follow. Close proximity to major urban centers is not uncommon. California, of course, is home to silicon valley and home to many tech fortunes. New York is, well, New York. Florida is a tax haven for the wealthy due to the friendly tax environment and Texas can claim the same. 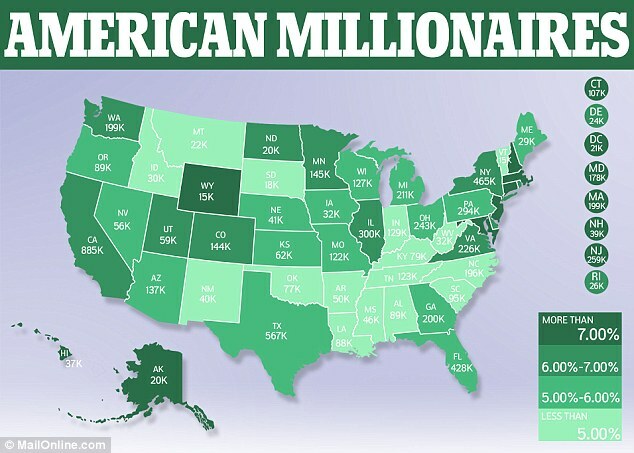 Overall there are millionaires to be found in every state, though the middle of the country and the south (outside of Florida) can not claim as many as the coasts. California’s 885,000 millionaires dwarfs the 40,000 found in New Mexico. The state of Wyoming has the least amount of total millionaires (15,000), but ranks 15th when looked at in terms of density. Similarly, Mississippi has the lowest concentration of millionaires and ranks 35th in terms of its total number. America’s millionaires are spread out across the country. Many are seeking friendly tax environments such as Florida or Texas. What this means is that location matters. Across the country, costs vary widely based on location. State and local taxes play a big role in your overall cost of living; as does the cost and availability of housing. Even high-cost areas can see a large variation between expenses. For example, California has the highest number of millionaires in the country from a pure numbers perspective. Cape Cod in Massachusetts has a lower number but a higher density. Let’s use City vs City to compare these two areas and see how cost of living varies between the two. While neither city is “cheap” to live in; the California city of Santa Barbara is more expensive. Requiring a whopping 21% less in pretax income, Cape Cod is a better bang for your buck. City vs City compares costs between these or any two cities by using real costs curated at the zip code level. Simply input your data and select your two zip codes. As a result, City vs City will show you the difference in cost of living expenses between the two cities. Whether you’re one of America’s millionaires or hoping to be: City vs City can help you decide where to live that will offer a better cost of living situation. If you’re thinking of moving, don’t make a move without downloading City vs City first.